Bee Propolis Extract, 1 fl oz / 30 ml each (Nature's Wonderland) - Penn Herb Co. Ltd.
Propolis is a tree resin bees use to coat their hive. It protects the hive from germs and keeps the bees healthy. Now you can fortify your defenses with the power of the hive! 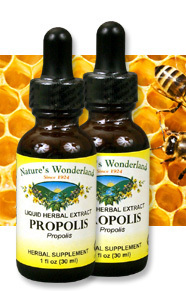 Bee Propolis provides immediate immune support at the first sign of distress. Our powerful Bee Propolis extract serves dual protective roles: Use it to reinforce your immune defense AND as a topical first aid remedy. AMOUNT PER SERVING (200mg/ml or 30 drops): Certified Organic Propolis Gum. OTHER INGREDIENTS: Grain Alcohol (75-85% by volume), Deionized Water. Lead Free. Farmed. Free of: milk, dairy, egg, fish, shellfish, tree nuts, peanuts, wheat, gluten or soy. Immediate immune system support; promotes upper respiratory tract health. 10-25 drops in water or juice, 2-3 times daily or as needed. External use is also effective. DO NOT TAKE DURING PREGNANCY. Shake well before using. Locate the Lot Number on your package, then click the corresponding Lot Number below to view the Certificate of Analysis for that item. The top line displays the Certificate for the lot currently available from inventory. Other lots below top line are no longer available.